Persons age 65 and older constitute the fastest growing segment of the American population. Although the extent of alcoholism among the elderly is debated, the diagnosis and treatment of alcohol problems are likely to become increasingly important as the elderly population grows. This Alcohol Alert reviews recent research on the extent of alcohol consumption and associated problems among the elderly, updating an earlier Alcohol Alert on this subject (1). Surveys of different age groups in the community suggest that the elderly, generally defined as persons older than 65, consume less alcohol and have fewer alcohol-related problems than younger persons. However, some surveys that track individuals over time suggest that a person’s drinking pattern remains relatively stable with age, perhaps reflecting societal norms that prevailed when the person began drinking (1). For example, persons born after World War II may show a higher prevalence of alcohol problems than persons born in the 1920’s, when alcohol use was stigmatized (2). In addition, some people increase their alcohol consumption later in life, often leading to late-onset alcoholism (1). In contrast to most studies of the general population, surveys conducted in health care settings have found increasing prevalence of alcoholism among the older population (3). Surveys indicate that 6 to 11 percent of elderly patients admitted to hospitals exhibit symptoms of alcoholism, as do 20 percent of elderly patients in psychiatric wards and 14 percent of elderly patients in emergency rooms (4). In acute-care hospitals, rates of alcohol-related admissions for the elderly are similar to those for heart attacks (i.e., myocardial infarction) (5). Yet hospital staff are significantly less likely to recognize alcoholism in an older patient than in a younger patient (6). The prevalence of problem drinking in nursing homes is as high as 49 percent in some studies, depending in part on survey methods (7). The high prevalence of problem drinking in this setting may reflect a trend toward using nursing homes for short-term alcoholism rehabilitation stays (8). Late-onset alcohol problems also occur in some retirement communities, where drinking at social gatherings is often the norm (9). Questionnaires customarily used to screen for alcoholism may be inappropriate for the elderly, who may not exhibit the social, legal, and occupational consequences of alcohol misuse generally used to diagnose problem drinkers (10,11). Alcohol-related consequences of heavy drinking can be mistaken for medical or psychiatric conditions common among the elderly. Such consequences may include depression, insomnia, poor nutrition, congestive heart failure, and frequent falls (1). Because alcohol-related illnesses are a major cause of premature death, excess mortality among heavy drinkers may leave a surviving older population who consume less alcohol (1). The incidence of hip fractures in the elderly increases with alcohol consumption (12,13). This increase can be explained by falls while intoxicated combined with a more pronounced decrease in bone density in elderly persons with alcoholism compared with elderly nonalcoholics (4). Studies of the general population suggest that moderate alcohol consumption (up to two drinks per day for men and one drink per day for women) may confer some protection from heart disease (14,15).1 Although research on this issue is limited, evidence shows that moderate drinking also has a protective effect among those older than 65 (16). Because of age-related body changes in both men and women, NIAAA recommends that persons older than 65 consume no more than one drink per day (17). Alcohol-involved traffic crashes are an important cause of trauma and death in all age groups. The elderly are the fastest growing segment of the driving population. A person’s crash risk per mile increases starting at age 55, exceeding that of a young, beginning driver by age 80. In addition, older drivers tend to be more seriously injured than younger drivers in crashes of equivalent magnitude (18). Age may interact with alcoholism to increase driving risk. For example, an elderly driver with alcoholism is more impaired than an elderly driver without alcoholism after consuming an equivalent dose of alcohol, and has a greater risk of a crash (18). Long-term alcohol consumption activates enzymes that break down toxic substances, including alcohol. Upon activation, these enzymes may also break down some common prescription medications. The average person older than 65 takes two to seven prescription medications daily. Alcohol-medication interactions are especially common among the elderly, increasing the risk of negative health effects and potentially influencing the effectiveness of the medications (19,20). Depressive disorders are more common among the elderly than among younger people and tend to co-occur with alcohol misuse (11,21). Data from the National Longitudinal Alcohol Epidemiologic Survey demonstrate that, among persons older than 65, those with alcoholism are approximately three times more likely to exhibit a major depressive disorder than are those without alcoholism (22). In one survey, 30 percent of 5,600 elderly patients with alcoholism were found to have concurrent psychiatric disorders (23). Among persons older than 65, moderate and heavy drinkers are 16 times more likely than nondrinkers to die of suicide, which is commonly associated with depressive disorders (24). Does Aging Increase Sensitivity to Alcohol? Limited research suggests that sensitivity to alcohol’s health effects may increase with age. One reason is that the elderly achieve a higher blood alcohol concentration (BAC) than younger people after consuming an equal amount of alcohol. The higher BAC results from an age-related decrease in the amount of body water in which to dilute the alcohol. Therefore, although they can metabolize and eliminate alcohol as efficiently as younger persons, the elderly are at increased risk for intoxication and adverse effects (25). Aging also interferes with the body’s ability to adapt to the presence of alcohol (i.e., tolerance). Through a decreased ability to develop tolerance, elderly subjects persist in exhibiting certain effects of alcohol (e.g., incoordination) at lower doses than younger subjects whose tolerance increases with increased consumption (26). Thus, an elderly person can experience the onset of alcohol problems even though his or her drinking pattern remains unchanged. These conclusions are supported by laboratory experiments with rats that indicate age-related changes in tolerance to alcohol (27). Aging and alcoholism produce similar deficits in intellectual (i.e., cognitive) and behavioral functioning. Alcoholism may accelerate normal aging or cause premature aging of the brain. Using magnetic resonance imaging techniques, Pfefferbaum and colleagues (28) found more brain tissue loss in subjects with alcoholism than in those without alcoholism, even after their ages had been taken into account. In addition, older subjects with alcoholism exhibited more brain tissue loss than younger subjects with alcoholism, often despite similar total lifetime alcohol consumption. These results suggest that aging may render a person more susceptible to alcohol’s effects (29). The frontal lobes of the brain are especially vulnerable to long-term heavy drinking (28). Research shows that shrinkage of the frontal lobes increases with alcohol consumption and is associated with intellectual impairment in both older and younger subjects with alcoholism (30). In addition, older persons with alcoholism are less likely to recover from cognitive deficits during abstinence than are younger persons with alcoholism (28). Age-related changes in volume also occur in the cerebellum, a part of the brain involved in regulating posture and balance (31). Thus, long-term alcohol misuse could accelerate the development of age-related postural instability, increasing the likelihood of falls (32). Studies indicate that elderly persons with alcohol problems are at least as likely as younger persons to benefit from alcoholism treatment. The outcomes are more favorable among persons with shorter histories of problem drinking (i.e., late onset). Additionally, although evidence is not entirely consistent, some studies suggest that treatment outcomes may be improved by treating older patients in age-segregated settings (33,23). The use of medications to promote abstinence has not been studied extensively in elderly subjects. However, one study has suggested that naltrexone (ReVia®) may help prevent relapse to alcoholism in subjects ages 50 to 70 (34). Results of research in animals suggest that age-related alterations in specific chemical messenger systems in the brain may alter the effectiveness of medications used to treat alcoholism and mental disorders (35). Because alcohol problems among older persons often are mistaken for other conditions associated with the aging process, alcohol abuse and alcoholism in this population may go undiagnosed and untreated or be treated inappropriately. Health care providers should discuss alcohol use with their older patients as a part of routine care. Advice to older patients should include the medical conditions common to older people, such as high blood pressure and ulcers, that can be worsened by drinking and over-the-counter and prescription drugs that can be dangerous, or fatal, when mixed with alcohol. Where there is no medical condition that would preclude the use of alcohol, older patients should be advised to limit their alcohol intake to one drink per day. Finally, health care providers, including emergency room personnel and admitting physicians who suspect an alcohol problem in their elderly patients, should refer such patients to treatment. It is a mistaken belief that older persons have little to gain from alcoholism treatment; each stage of life has its own rewards for sobriety, and they are all valuable. The National Institute on Alcohol Abuse and Alcoholism wishes to acknowledge the following individuals who have contributed their time and expertise to the development of the Alcohol Alert series over the past several years: John Allen, Ph.D.; Loran D. Archer; Gregory Bloss; Gayle Boyd, Ph.D.; John Doria; Mary Dufour, M.D., M.P.H. ; Michael Eckardt, Ph.D.; Joanne Fertig, Ph.D.; Richard Fuller, M.D. ; David Goldman, M.D. ; Bridget Grant, Ph.D., Ph.D; Brenda Hewitt; Susanne Hiller-Sturmhoefel, Ph.D.; Jan Howard, Ph.D.; Walter Hunt, Ph.D.; Leslie Isaki, Ph.D.; Robert Karp, Ph.D.; William Lands, Ph.D.; the late Markku Linnoila, M.D., Ph.D.; Stephen Long; Susan Martin, Ph.D.; Margaret Mattson, Ph.D.; Diane Miller; Theodore Pinkert, M.D. ; Norman Salem, Jr., Ph.D.; Eve Shapiro; Ernestine Vanderveen, Ph.D.; Kenneth Warren, Ph.D.; Forrest Weight, Ph.D.; Dianne Welsh; Ellen Witt, Ph.D.; Lori Wolfgang; and Sam Zakhari, Ph.D.
(1) National Institute on Alcohol Abuse and Alcoholism. Alcohol Alert No. 2: Alcohol and Aging. Bethesda, MD: the Institute, 1988. (2) Beresford, T.P. Alcoholic elderly: Prevalence, screening, diagnosis, and prognosis. In: Beresford, T., and Gomberg, E. Alcohol and Aging. New York: Oxford University Press, 1995. pp. 3-18. (3) Adams, W.L. Interactions between alcohol and other drugs. In: Gurnack, A.M., ed. Older Adults’ Misuse of Alcohol, Medicines, and Other Drugs: Research and Practice Issues. New York: Springer, 1997. pp. 185-205. (4) Council on Scientific Affairs, American Medical Association. Alcoholism in the elderly. JAMA 275(10):797-801, 1996. (5) Adams, W.L. ; Yuan, Z.; Barboriak, J.J.; et al. Alcohol-related hospitalizations of elderly people. JAMA 270(10):1222-1225, 1993. (6) Curtis, J.R.; Geller, G.; Stokes, E.J. ; et al. Characteristics, diagnosis, and treatment of alcoholism in elderly patients. J Am Geriatr Soc 37:310-316, 1989. (7) Joseph, C.L. Misuse of alcohol and drugs in the nursing home. In: Gurnack, A.M., ed. Older Adults’ Misuse of Alcohol, Medicines, and Other Drugs: Research and Practice Issues. New York: Springer, 1997. pp. 228-254. (8) Adams, W.L., and Cox, N.S. Epidemiology of problem drinking among elderly people. In: Gurnack, A.M., ed. Older Adults’ Misuse of Alcohol, Medicines, and Other Drugs: Research and Practice Issues. New York: Springer, 1997. pp. 1-23. (9) Atkinson, R.M. ; Tolson, R.L. ; and Turner, J.A. Late versus early onset problem drinking in older men. Alcohol Clin Exp Res 14(4):574-579, 1990. (10) Lakhani, N. Alcohol use amongst community-dwelling elderly people: A review of the literature. J Adv Nurs 25(6):1227-1232, 1997. (11) Adams, W.L. Late life outcomes: Health services use and the clinical encounter. In: Gomberg, E.S.L. ; Hegedus, A.M.; and Zucker, R.A. Alcohol Problems and Aging. NIAAA Research Monograph No. 33. NIH Pub. No. 98-4163. Bethesda, MD: NIAAA, 1998. (12) Bikle, D.D. ; Stesin, A.; Halloran, B.; et al. Alcohol-induced bone disease: Relationship to age and parathyroid hormone levels. Alcohol Clin Exp Res 17(3):690-695, 1993. (13) Schnitzler, C.M. ; Menashe, L.; Sutton, C.G. ; et al. Serum biochemical and haematological markers of alcohol abuse in patients with femoral neck and intertrochanteric fractures. Alcohol Alcohol 23(2):127-132, 1988. (14) Klatsky, A.L. ; Armstrong, M.A. ; and Friedman, G.D. Alcohol and mortality. Ann Intern Med 117(8):646-654, 1992. (15) Thun, M.J.; Peto, R.; Lopez, A.D.; et al. Alcohol consumption and mortality among middle-aged and elderly U.S. adults. New Engl J Med 337(24):1705-1714, 1997. (16) Fried, L.P.; Kronmal, R.A.; Newman, A.B. ; et al. Risk factors for 5-year mortality in older adults: The cardiovascular health study. JAMA 279(8):585-592, 1998. (17) Dufour, M.C. ; Archer, L.; and Gordis, E. Alcohol and the elderly. Clin Geriatr Med 8(1):127-141, 1992. (18) Waller, P.F. Alcohol, aging, and driving. In: Gomberg, E.S.L. ; Hegedus, A.M.; and Zucker, R.A. Alcohol Problems and Aging. NIAAA Research Monograph No. 33. NIH Pub. No. 98-4163. Bethesda, MD: NIAAA, 1998. (19) Korrapati, M.R., and Vestal, R.E. 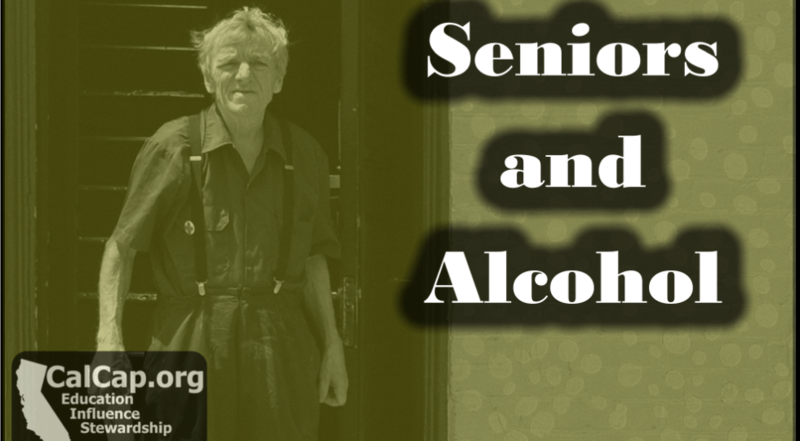 Alcohol and medications in the elderly: Complex interactions. In: Beresford, T., and Gomberg, E., eds. Alcohol and Aging. New York: Oxford University Press, 1995. pp. 42-55. (20) National Institute on Alcohol Abuse and Alcoholism. Alcohol Alert. No. 27: Alcohol-Medication Interactions. Bethesda, MD: the Institute, 1995. (21) Welte, J.W. Stress and elderly drinking. In: Gomberg, E.S.L. ; Hegedus, A.M.; and Zucker, R.A. Alcohol Problems and Aging. NIAAA Research Monograph No. 33. NIH Pub. No. 98-4163. Bethesda, MD: NIAAA, 1998. (22) Grant, B.F., and Harford, T.C. Comorbidity between DSM–IV alcohol use disorders and major depression: Results of a national survey. Drug Alcohol Depend (39):197-206, 1995. (23) Moos, R.; Brennan, P.; and Schutte, K. Life context factors, treatment, and late-life drinking behavior. In: Gomberg, E.S.L. ; Hegedus, A.M.; and Zucker, R.A. Alcohol Problems and Aging. NIAAA Research Monograph No. 33. NIH Pub. No. 98-4163. Bethesda, MD: NIAAA, 1998. (24) Grabbe, L.; Demi, A.; Camann, M.A. ; et al. The health status of elderly persons in the last year of life: A comparison of deaths by suicide, injury, and natural causes. Am J Public Health 87(3):434-437, 1997. (25) Dufour, M., and Fuller, R.K. Alcohol in the elderly. Annu Rev Med 46:123-132, 1995. (26) Kalant, H. Pharmacological interactions of aging and alcohol. In: Gomberg, E.S.L. ; Hegedus, A.M.; and Zucker, R.A. Alcohol Problems and Aging. NIAAA Research Monograph No. 33. NIH Pub. No. 98-4163. Bethesda, MD: NIAAA, 1998. (27) Spencer, R.L., and McEwen, B.S. Impaired adaptation of the hypothalamic-pituitary-adrenal axis to chronic ethanol stress in aged rats. Neuroendocrinology 65(5):353-359, 1997. (28) Pfefferbaum, A.; Sullivan, E.V. ; Mathalon, D.H.; et al. Frontal lobe volume loss observed with magnetic resonance imaging in older chronic alcoholics. Alcohol Clin Exp Res 21(3):521-529, 1997. (29) Oscar-Berman, M.; Shagrin, B.; Evert, D.L. ; et al. Impairments of brain and behavior: The neurological effects of alcohol. Alcohol Health Res World 21(1):65-75, 1997. (30) Harper, C.; Kril, J.; Sheedy, D.; et al. Neuropathological studies: The relationship between alcohol and aging. In: Gomberg, E.S.L. ; Hegedus, A.M.; and Zucker, R.A. Alcohol Problems and Aging. NIAAA Research Monograph No. 33. NIH Pub. No. 98-4163. Bethesda, MD: NIAAA, 1998. (31) Sullivan, E.V. ; Rosenbloom, M.J.; Deshmukh, A.; et al. Alcohol and the cerebellum. Alcohol Health Res World 19(2):138-141, 1995. (32) Malmivaara, A.; Heliovaara, M.; Knekt, P.; et al. Risk factors for injurious falls leading to hospitalization or death in a cohort of 19,500 adults. Am J Epidemiol 138(6):384-394, 1993. (33) Atkinson, R. Treatment programs for aging alcoholics. In: Beresford, T., and Gomberg, E., eds. Alcohol and Aging. New York: Oxford University Press, 1995. pp. 186-210. (34) Oslin, D.W., and Mellow, A.M. Neurotransmitter-based therapeutic strategies in late-life alcoholism and other addictions. In: Gomberg, E.S.L. ; Hegedus, A.M.; and Zucker, R.A. Alcohol Problems and Aging. NIAAA Research Monograph No. 33. NIH Pub. No. 98-4163. Bethesda, MD: NIAAA, 1998. (35) Druse, M.J.; Tajuddin, N.F. ; and Ricken, J.D. Effects of chronic ethanol consumption and aging on 5-HT2A receptors and 5-HT reuptake sites. Alcohol Clin Exp Res 21(7):1157-1164, 1997. 1A standard drink is generally considered to be 12 ounces of beer, 5 ounces of wine, or 1.5 ounces of distilled spirits, each drink containing approximately 0.5 ounces of alcohol.